(CBS/AP) NEW ORLEANS - Why is there a live tiger at a truck stop west of Baton Rouge? That's what an animal advocacy group and a former state legislator want to know. 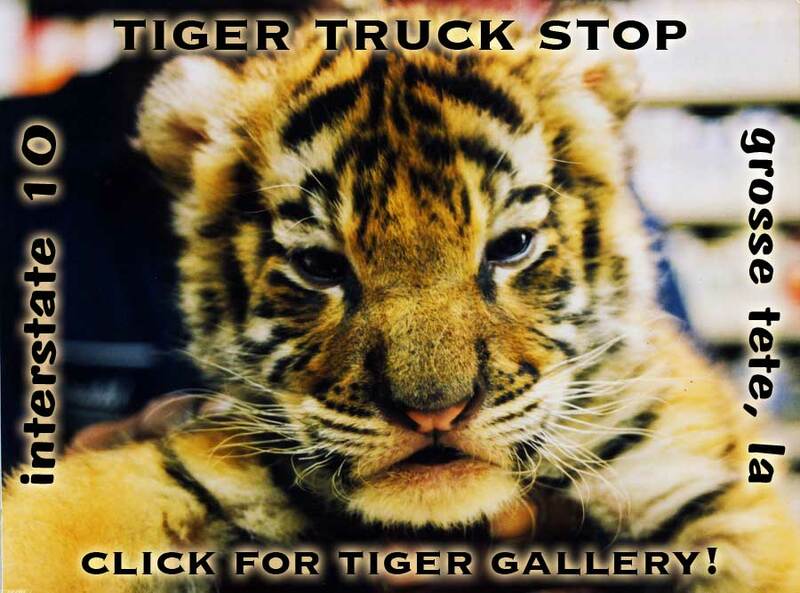 Actually, they want to put a stop to it, so they're suing Louisiana wildlife officials, claiming they violated the law when they issued a permit allowing a live tiger to be on display at the Tiger Truck Stop in Grosse Tete, La. The Animal Legal Defense Fund and former state Rep. Warren Triche Jr. are among plaintiffs in the lawsuit filed Monday in state district court in Baton Rouge. The permit was originally issued in 2009, and reissued last year, to Michael Sandlin. Sandlin and some animal advocacy groups have been at odds for years over his keeping of exotic cats at the truck stop. He currently keeps one adult tiger, 10-year-old Tony (what else? ), in a large caged area just off a parking area at the facility. He touts the tiger exhibit on his website as a tourist draw, along with a Cajun restaurant, video poker and tire service for truckers. The lawsuit says regulations adopted by the department under a 2006 state law forbid the possession of tigers. People who legally owned such animals prior to the 2006 law could continue to be permitted. But the lawsuit says Sandlin's keeping of tigers before the law was passed also was illegal, violating a parish law. Also, the lawsuit claims, Sandlin cannot keep a tiger at the truck stop because he does not live on the premises as required by law. Sandlin, who is not a defendant in the lawsuit, said Tuesday that the parish ordinance did not apply to roadside zoos such as his. He added that his business is open around the clock so there is always someone on the property, which meets the intent of the residency requirement, and he said he is prepared to move a trailer onto the property if need be. Sandlin said he has been exhibiting tigers at the truck stop since 1988 and that they have always been well cared for. He accused the Animal Legal Defense Fund of seeking publicity to raise funds at his expense.